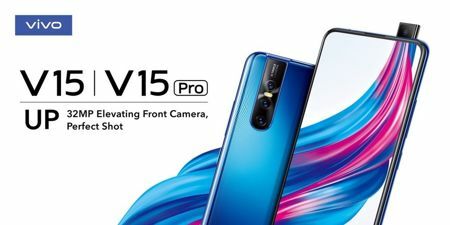 Chinese smartphone manufacturer continues to break new ground with a spanking new device, the Vivo V15Pro smartphone. This all-new handset will be the first model after the NEX flagship concept that sports the industry’s first elevating front camera, a cool feature that makes you want to play with it over and over again. Granted, the moving parts will eventually experience enough wear and tear to cause problems, but I suppose it is robust enough to last until you get tired of the device and shoot for a newer handset. With the Vivo V15Pro, you will find that it sports upgraded AI technology with the Google Assistant built-in. >!–more–>In terms of its photo taking ability, the Vivo V15Pro is not a handset to be trifled with. It boasts of the AI Triple Camera that will help elevate your photography sessions to a whole new level, and security is further augmented courtesy of in-display fingerprint scanning. The front camera will feature an elevating mechanism and packs in a whopping 32MP that will help capture great looking selfies with unrivalled clarity. Getting rid of the notch will also provide a stunning 91.64% screen-to-body ratio, resulting in an unprecedented immersive viewing experience that is ideal for both gaming and video viewing. The side and top bezels measure a mere 1.75mm and 2.2mm respectively, making you feel as though you are immersed in whatever you’re looking at. At the back lies a 48MP quad pixel sensor, an 8MP super wide-angle camera, and a 5MP depth camera that will help you capture great looking shots without even trying very hard. With a “four-in-one pixel” technology in the main rear camera that merges four pixels into one large pixel, you end up with high-quality 12MP photos even in low light conditions. In terms of performance, the Vivo V15Pro will not disappoint with the Snapdragon 675AIE Octa-core processor running underneath the hood. There are two models available: one with 6GB of RAM while the other has 8GB of RAM, but both will feature 128GB of internal storage space. There is no word on pricing as at press time, but it will certainly cost a pretty penny considering the flagship level hardware it comes with.